Value Added Business Intelligence Offering the Right Information at the Right Time, the Right Place. We @ SPEC INDIA have certified Pentaho consultants offering Pentaho BI services and solutions including consulting, development, integration, dashboard design, analytics & reporting & other Pentaho business intelligence services. Our Pentaho BI Consulting team provides comprehensive end-to-end solutions, which would typically cover data integration, data cleansing, data consolidation and visualization using the Pentaho product stack. Pentaho BI suite is a complete suite of Pentaho business analytics – Pentaho EE (Server), Pentaho CE (Server), Pentaho EE/CE (Client), for BI, Big Data & Data Integration. 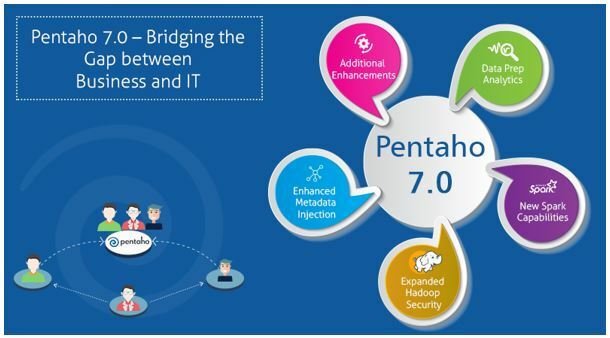 Pentaho Open Source community offers modern, integrated and Embeddable platform built for accessing virtually all types of data sources including Big Data. Pentaho tightly couples data integration with business analytics to easily access, mine, visualize, and explore all data that impacts business results. Assisting organizations to frame their future towards analytics, Pentaho Consulting excels in any type of BI requirement apart from its proficiency in Traditional BI, Embedded BI, Mobile BI, Self Service BI, Agile BI and Predictive BI. Continuing with our endeavor to support the developer community, we have successfully launched a Self Service BI solution, in the form of a plug-in for Pentaho Community edition users on the Pentaho marketplace for global users and developers. This innovative and enriched plug-in aims to serve as a dashboard module for business analyst to independently, create reusable widgets / dashboards and is sure to benefit the community with its visually appealing features, dashboards and Pentaho reporting. Strategized Pentaho BI consulting process to avail maximized benefit, enhanced decision support and value-added business. Our BI team possesses skilled expertise in advanced and trending features of Pentaho like Embedded Analytics APIs, New Analyzer APIs, and Streamlined Data Refinery etc. We contribute to the Pentaho community regularly. We have developed a custom Pentaho Plug-In called ‘Bootstrap Dashboard Designer’ and a MongoDB GridFS Plug-In, which are globally available on the Pentaho marketplace. Why SPEC INDIA for 'Pentaho Services & Solutions'? Our expert pool of Pentaho resources is skilled at implementing all components of the Pentaho product stack, for a variety of industry domains. Dueto wide-spread experience in all foremost technologies, our software professionals are well versed with domain-oriented workflows and best practices. Our concentration towards keeping well-informed with contemporary technologies keeps us at an equivalent pace with the high-tech world. An ISO 9001:2015 certified organization having vast and trustworthy experience in Pentaho consulting services, all over the globe. Our Pentaho consultants are proficient with the entire umbrella of Pentaho product stack and offer comprehensive solutions, covering Pentaho integration, data cleansing, data consolidation and visualization.